Presented in seventeen chapters that can be approached as singular gateways or a slowly unfolding journey of epic proportions, the debut album of Arktau Eos is a challenging, complex work. Born of intense private musico-magical sessions held in places abandoned by man and further refined in the temple-laboratory of the duo, it is the distillation of seven arduous months of work. As the title suggests, ‘Mirrorion’ is the music of stellar light thrown down from the Heaven’s zenith and its eldritch reflections in the depths below, uniting atavistic elemental noise with serene passages of crystalline, spectral ambience. Ultimately, ‘Mirrorion’ seeks to surpass such earthly definitions in favour of a non-dual vision of reality, hopefully transforming the listener in the process. For this recording Arktau Eos have favoured an organic approach with majority of instrumentation being of acoustic variety, including the unearthly choral of the kanglings, piercings blasts of windbones, accelerating steel-plate rolls, singing bowl and various kinds of stringed instruments. 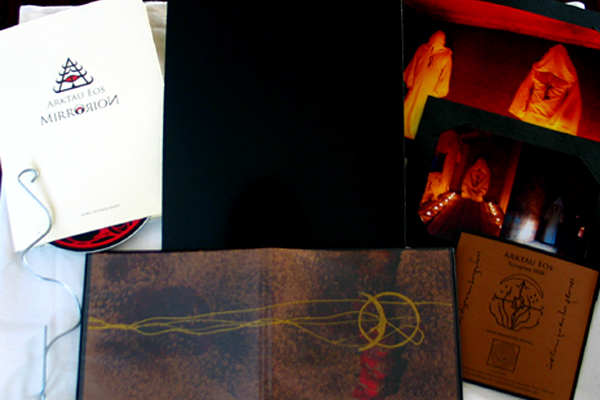 The album comes in an six-panel, A5 booklet. Limited to 1000 copies. The ‘Mirrorion’ box set includes: ‘Mirrorion’ CD, ‘Scorpion Milk’ CD-R, two exclusive insert cards, a black mirror enriched with unique automatic drawings. The box set comes in a white cloth bag, sealed with a metal clip. The box is numbered and limited to 80 copies. Moreover, an extremely limited, undisclosed number of out-of-series editions are distributed secretly.